If you’re on a budget and looking for a piano, you may be trying to decide whether an acoustic piano or digital piano is the best choice. To help you make an informed decision, let me start out with a little story based on my own personal experience. I studied piano performance for four years, the program and teachers were phenomenal, but the facility was a little out of date. The practice rooms had old upright acoustic pianos, and they all had various maintenance issues that made them frustrating to practice on—broken keys, non-functioning pedals, and sound that just wasn’t very pretty. In addition, the feel of the keyboard action on the instruments was quite light and unexpressive, probably due to age and wear. The practice rooms themselves weren’t so great either. They were in a cramped area of the music building, separated by thin walls. I could hear students practicing in other rooms, and as you can probably imagine, not everyone that was playing was a piano performance major. Hearing other pianists jamming out at the same time made practicing a delicate Debussy prelude maddening. In desperate need of a better practicing situation, I bought a Roland FP-7F Digital Piano for my apartment, and it was a breath of fresh air. The feel was so much better than the practice acoustic pianos, the pedals worked, and the sound was great. Best of all, thanks to the ability to play with headphones, I could practice silently at any hour of the day without hearing a bunch of other pianists (or having my next-door neighbors hear me). I practiced on that keyboard for all of my performances, including two degree-earning recitals. We’re talking heavy-duty classical, romantic, and contemporary repertoire. These styles require special pedal effects, an enormous range of dynamics, and incredibly fast repetition on the keys—and the FP-7F allowed me to practice all of those musical nuances just like an acoustic piano. My point? Even as a serious collegiate piano student, I was able to get everything I needed and more from a high-quality digital keyboard at the same price point I could’ve purchased a low-quality acoustic piano. 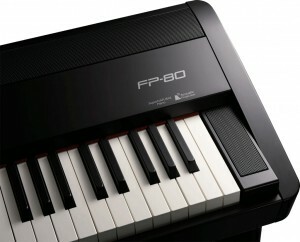 I enjoyed the FP-7F because it gave me an awesome sound with an expressive and realistic key touch. To me, these are the most important characteristics of any piano, whether it’s digital or acoustic. Best of all, the FP-7F could fit in my apartment. For my situation, the biggest benefit of the FP-7F piano as opposed to an acoustic piano was being able to play with headphones. The motivation to practice piano can happen at any time of the day, and it’s best to take advantage of those creative bursts by hopping on the piano as they come. But with an acoustic piano, that’s not always an option—your desire to play has to wait if it’s late at night or early in the morning, or if you have easily annoyed neighbors or even a reasonable roommate who just needs some quiet. Certainly for a college music student like I was at the time—and really for anyone that wants to play the piano—the option of practicing at any time is immensely useful. It allowed me to take advantage of my creative energy, as well as to work around my busy class schedule. Beyond the excellent feel, great sound, and the ability to practice silently, high-quality digital pianos offer many useful features as well. For example, the built-in metronome is handy to have when checking tempos, or rehearsing sections where you tend to rush. Onboard recording is found in many digital pianos, and it’s an excellent tool for tracking your progress. I like to record my performance once I’ve learned a musical piece well enough to play it straight through. Then, I can objectively evaluate the areas I need to improve. After practicing more, I’ll record the piece again. It’s always fascinating and exciting to see how the piece changes as I work it further into my muscle memory and play with more musical nuances. Recording and listening to your own performances is one of the best ways to get better as a musician, and having this resource so readily available is extremely beneficial for improvement. One of the fun features that many digital pianos offer is additional non-piano sounds. At Christmas time, I always break out the music book for “A Charlie Brown Christmas” by Vince Guaraldi. My favorite thing to do with the digital piano is layer a vibes sound with the grand piano sound, and something about that tone combination just shouts out jazzy, Vince Guaraldi, Christmas-time joy. Even better, I’ll use the split piano feature to assign different sounds to the left and right hands, such as upright bass and piano or vibes. I’ll also turn on built-in rhythms for accompaniment, enabling me to practice as an entire jazz trio! Having the ability to change up the tones is an easy way to keep up the interest in practicing, as it provides something new to listen to and explore. What About a Low-Budget Acoustic Piano? Simply put, a digital piano usually always offers a far better value. Acoustic pianos at a low price point are likely to have many issues like those I detailed in my college story. Whether new or used, acoustic pianos require a lot of maintenance to maintain good working order, and this leads to a larger financial investment in the long run. Though it might seem like a good deal to begin with, an over-used and/or poorly maintained low-budget acoustic piano is not very inspiring to play, and will discourage more than inspire. For both new and seasoned piano students, practicing on a nice instrument is key to developing musicianship. If the piano has broken keys and causes the player’s fingers to bleed (yes, this has happened to me), practicing becomes something you don’t look forward to. Plus, if the key touch is so loose that you can’t repeat the same note quickly, it limits technical advancement and repertoire. On top of that, poor key touch inevitably leads to poor tone quality, making a higher level of musicality pretty much unattainable. 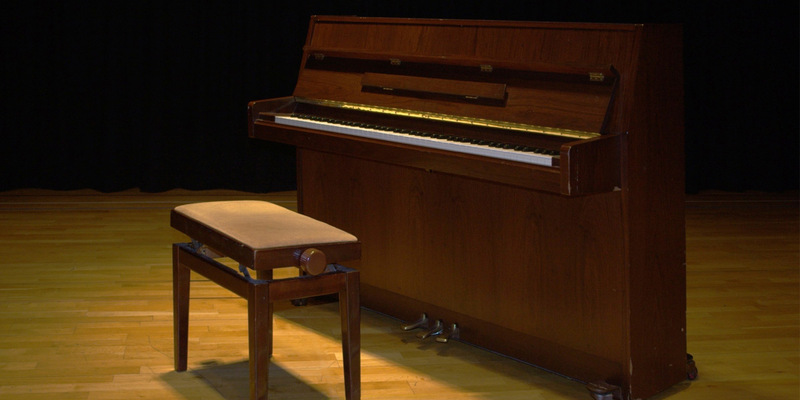 High-quality (i.e., very expensive) acoustic pianos are lovely to play on, but low-budget acoustic pianos are not so pleasant, and they can cause real problems for pianists of any level. From a girl who received her bachelor’s degree in piano performance, I can easily say that I prefer a digital piano over any beat-up, out of shape acoustic piano. 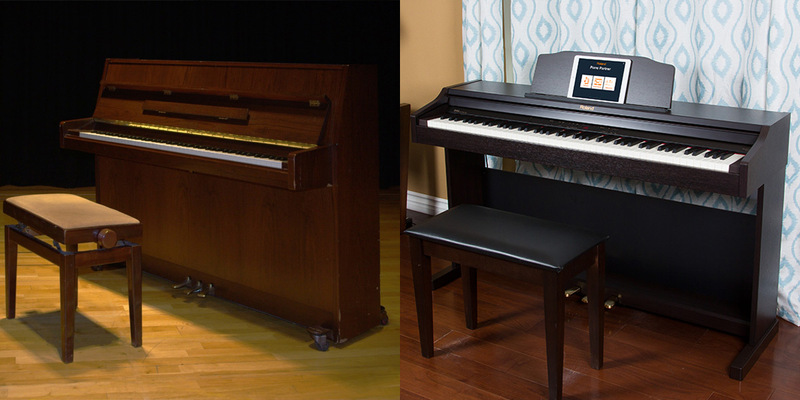 The bottom line: when you take your small budget and compare what you can purchase in an acoustic piano versus all you get with a quality digital piano, you’ll always get way better bang-for-your-buck with the digital instrument.